The Pabianice Landsmanshaft announces the publication of the English translation of Seyfer Pabianice (The Pabianice Yizkor book) originally published in Yiddish and Hebrew in 1956, edited by A. Wolf Jasni. 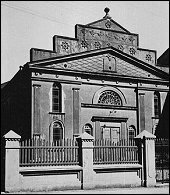 How many of us today hear testimonies of what Jewish life in Europe was like before World War 2? We are well informed about the Holocaust but the generation that spent their youth in pre-war Europe has aged and diminished in numbers. There are Yizkor books for many of the hometowns of our ancestors. These include historical accounts in words and photographs of the establishment of towns and their Jewish populations, of ordinary Jewish working life, of education, religion, social and Zionist activities and the impact of the Holocaust, including the Jewish resistance to it. These were usually written in Yiddish and Hebrew by a diverse range of authors. The accounts preserve for posterity a fast vanishing history and bring to life the vibrant culture that existed before the war. After their mother died two years ago, Ian and Eva Light realised a dream to have the Yizkor book of their mother’s hometown, Pabianice, translated into English. Pabianice is in south-west Poland near Lodz and became an important textile industry town in the nineteenth century. Translators Bobbie Zylberman, for the Yiddish, and Sara Brott, for the Hebrew, were engaged to translate the Pabianice Yizkor book into English. Editor Tony Thomas polished the final product. Seyfer Pabianice includes stories about many Jewish characters from the good years before and after the First World War, the establishment of Jewish schools, factories and banks, the interface between secular and religious Jewish life and relations with the non-Jewish population, accounts of the Jewish resistance in Belarus, and the moving story of how Rabbi Mendele Alter went bravely with his people to Treblinka. JewishGen at www.jewishgen.org is a source for copies of Yizkor books, and many national and international Jewish libraries including those in Melbourne hold copies. The Pabianice Yizkor book now takes its place beside them. The Pabianice Landsmanshaft hopes that other descendants of Holocaust survivors will be inspired to follow their example and make available these historical accounts to a wider audience. I am sending you this copy of the English translated Pabianice Yizkor book to be shared with Libraries and Pabianice Landsmanshaftn communities in Australia, Argentina, Canada, England, Israel, Poland and U.S.A.
Hopefully this book will be appreciated and enhance the knowledge of the Jewish Holocaust in these countries.